Meet Rick! He came in in January 2015 wanting to lose some bodyfat and get fitter. He's lost just over 16KG to date January 2016. Improved his strength (and lean muscle) immensely. More importantly, he initially had VERY bad forward neck and kyphosis (postural issue where the shoulders are of slouching forward). He also could not get past parallel on his squats. He's squatting full range over 85KG at the moment and gaining more all the time. 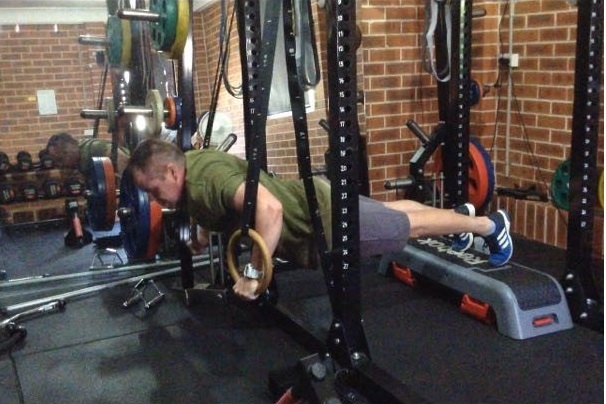 Rick could not do 1 single bodyweight dip or pullup when he first joined. He's now doing WEIGHTED pullups and dips with ease. As for bodyweight, (January 2016) he has hit a personal milestone of 17 bodyweight pullups without stopping and 27 bodyweight dips without stopping. Not bad for a guy that couldn't do 1 just a year ago. Rick has been diligent with his stretch routines and been consistent with his training and eating healthier. No, he's not on that 6 meal a day BS. People who train at Hybrid Training Systems don't do that junk! Introducing Andrew! He works hard everyday but never makes excuses to fit his weekly training sessions in. Andrew initially came to me in early 2014 with the goal of "getting fit/in-shape for his wedding". Andrew has had no prior gym/fitness training. When we first started, he was trying to find balance with just a 30KG barbell! Well, needless to say, Andrew has met and surpassed his goal and still trains with me now and meeting new goals! *Pictured here squatting 135KG - Late 2014. Charles came to me in early 2014 looking to increase his training intensity a little and make more progress! He also mentioned that it was his dream to join the Australian Police Force. When he first came in I spotted various form issues that were the root cause of his mobility/pain in certain areas (including the low back etc). He was also extremely tight in certain areas and required a lot of stretching/strengthening of other muscles. Charles has not only fixed his form issues but also grown A LOT stronger and flexible than he was when he initially came in! Guess what? Charles is also now a proud member of the Australian Police Force! Photo was taken on Brad's Anniversary. That didn't stop him from coming in for his training session! Brad is highly determined to reach his goals and never makes excuses. This guy is definitely the very definition of the words "dedicated" and "consistent"! Vanessa pictured here from mid 2014 doing an awesome clean and press! She is highly determined and made great body fat loss, fitness and endurance goals! Studio was extensively upgraded since the time of this shot. Zara. Pictured here in early 2013 @ Age 53! She initially came to me to get a little leaner and put on some lean muscle. Needless to say, she achieved her goal and then continued on for other goals! At her peak she was able to 5 unassisted bodyweight chinups and 85KG x 5 Deadlifts! Very impressive indeed! Andy hard at work on a Saturday evening! Just finishing up his workout with some 'accessory' bicep curls. Andy has made heaps progress especially in the lean muscle gain area in the last couple of months. Just over 7KG of lean mass to be exact! 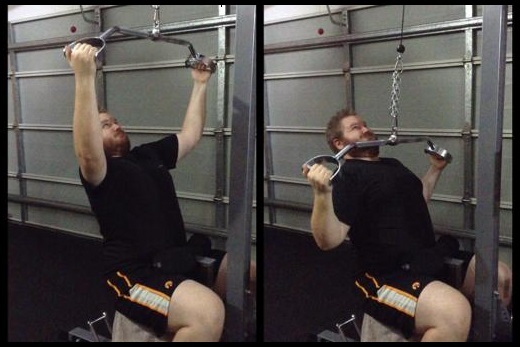 He's not only gained more muscle BUT also improved his posture immensely. No more upper back hunch and his slight head-lean is totally gone! Saff plays soccer competitively and came to me to get his fitness and strength up. Working on his weighted dips in this short clip! Very impressive at 20KG x 11 @ 66KG bodyweight. Training at Hybrid for about 3 months now. He's gone from maxing out 45KG squats and 2-3 chinups, NO dips... to 100KGx10 below-parallel squats and 8-10 chinups and 20KGx11 dips. ...MORE stories and photos to come soon!